Way back in 1974, as a 22-year-old in Louisville, I started a small electronics business called Cybertronic Systems to help fund my growing microprocessor addiction and begin my escape from the employment treadmill that was already looming as a dangerous life habit. Within about a year, I was doing enough sales out of my apartment to quit my job as a field engineer, and for the next five years I kept morphing the business in the attempt to keep up with fast-changing technology. Trying to be all things to all people is not a good business model, especially with bad work habits, so it was pretty rough going at times… and eventually I changed to full-time freelance writing. Q — What is Cybertronics? 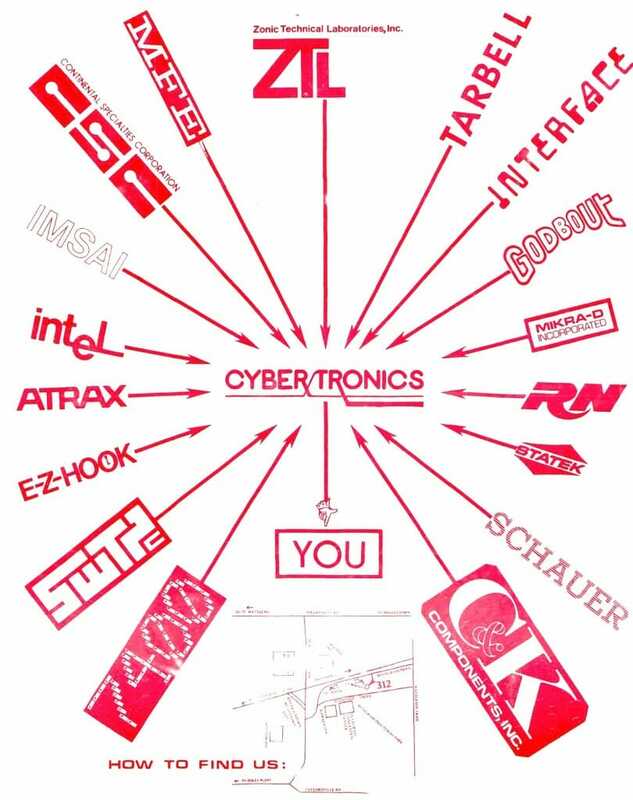 A1 — Cybertronics is an Electronic Parts House, operating at Retail, Wholesale, and Mail Order levels. By stocking in depth IC’s, Sockets, Discrete Components, Breadboarding & Test Hardware, and a wide variety of support hardware and accessories, we are providing the Louisville area and a national mail-order clientele with the State-of-the-Art in components. A2 — Cybertronics is a Computer Store, featuring Zonic Labs, IMSAI, and various other Microprocessor Systems, in assembled or kit form. With over six man-years of collective experience in the design and application of microprocessors, we are equipped to assist with a system from specification to software. In stock are CPU’s, Peripherals, and considerable support hardware. Come see our demo system! A3 — Cybertronics is an Engineering Firm, serving the industry with Custom Design, PC Artwork & Boards, and Process & Industrial Control Systems. Let us quote on your next engineering project. 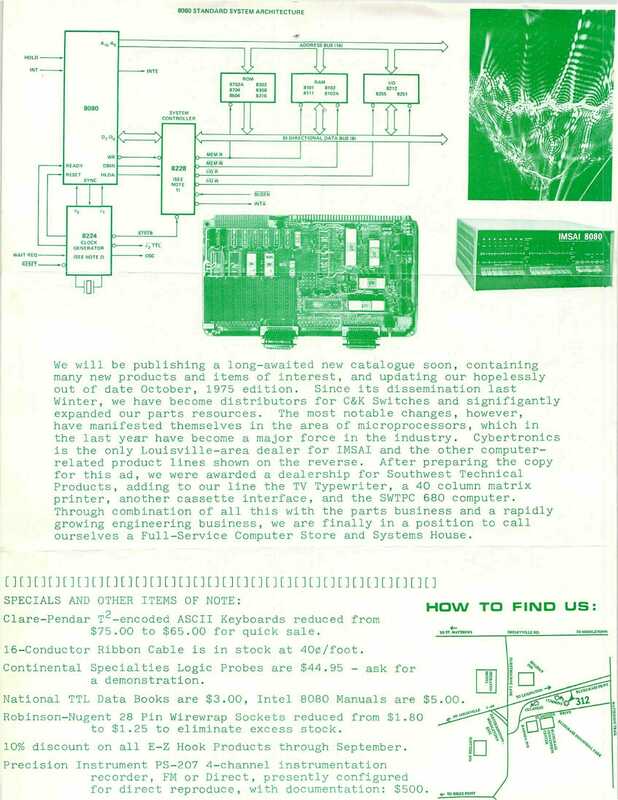 A4 — Cybertronics is a retail Electronic Equipment Store, with a continually changing inventory of surplus and used computer equipment, test equipment, and other one-of-a-kind items. We recently established a Consignment System, and are actively soliciting consignment merchandise of all types congruent with our business. Need to recover your investment in a dust-gathering piece of equipment, or to reclaim some floor or drawer space? Bring it by, and we’ll put it on display. 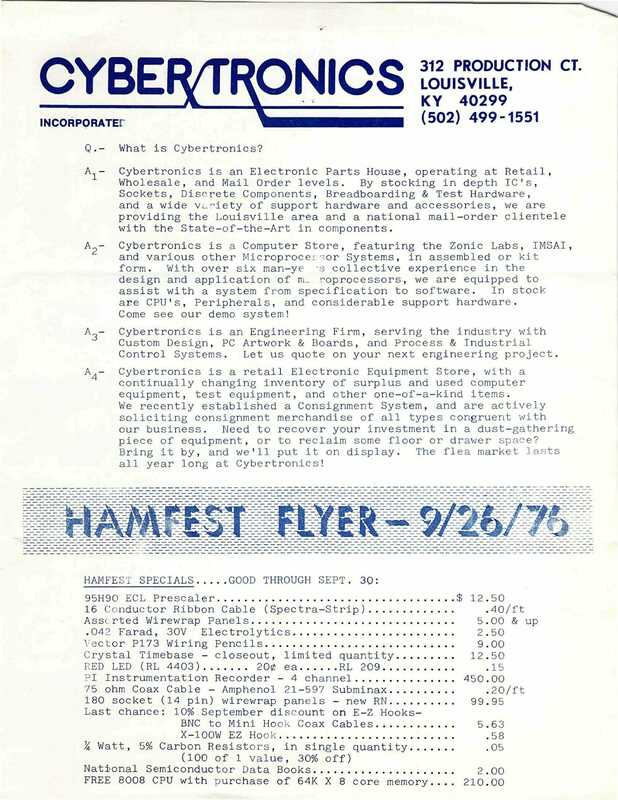 The flea market lasts all year long at Cybertronics! Cybertronics is back in operation as a Full-Service Parts House! A few months ago, we tried limiting our scope to wholesale and mail-order, allowing a local retailer to handle our walk-in business. Sales declined and, coupled with the lack of a new catalog, led to a loss of business that rapidly became disturbing. We have seen the light. Low prices may again be had in Louisville. We have added to our staff a capable engineer named Jim Helton who will be dedicated to the Parts Business, making possible substantially faster service, new products, new literature, and more technical information: he and I take this opportunity to welcome you back. We are open 9 to 5, or later by appointment, Monday through Friday. Come visit us in our new location in the Bluegrass Industrial Park – see map on reverse. Thank you for your patience – I look forward to seeing you! have manifested themselves in the area of microprocessors, which in the last year have become a major force in the industry. Cybertronics is the only Louisville-area dealer for IMSAI and the other computer-related product lines shown on the reverse. 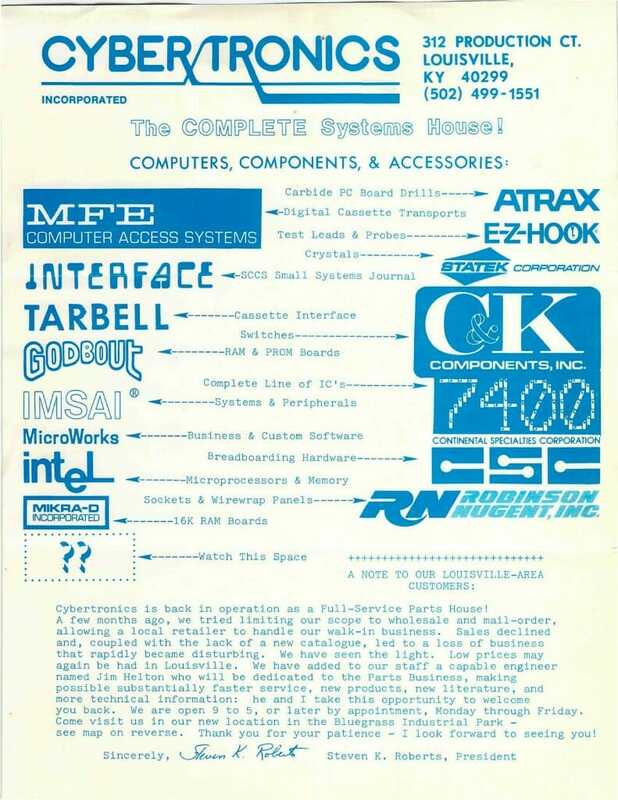 After preparing the copy for this ad, we were awarded a dealership for Southwest Technical Products, adding to our line the TV Typewriter, a 40 column matrix printer, another cassette interface, and the SWTPC 680 computer. Through combination of all this with the parts business and a rapidly growing engineering business, we are finally in a position to call ourselves a Full-Service Computer Store and Systems House. One of the running jokes back then was the need to seem bigger than we really were when talking to some companies… so tricks like dragging a finger over the electric typewriter keyboard to sound like a computer printing were not uncommon. 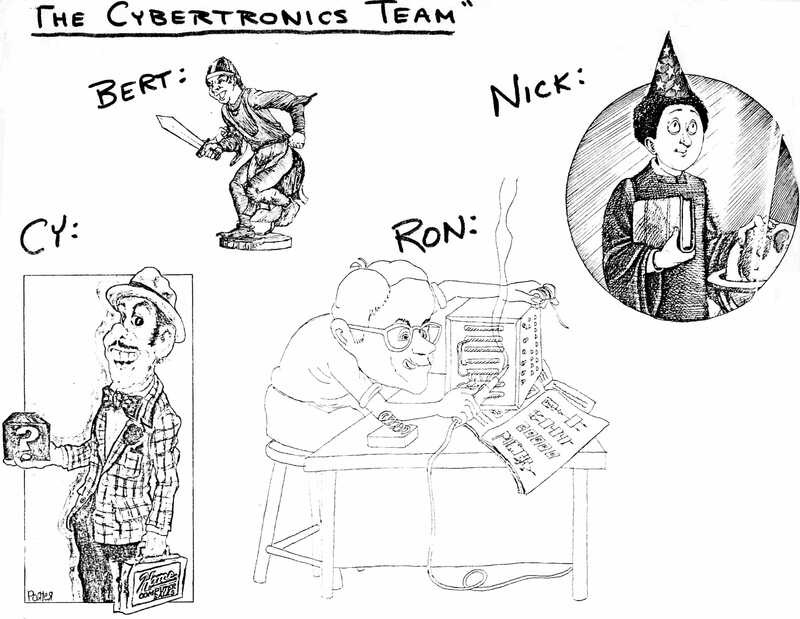 I also created the “Cybertronics Team” from found artwork, consisting of Cy (the marketing guy), Bert (hard-nosed business guy), Ron (brilliant weirdo in the back room), and Nick (visionary). I don’t think it fooled anybody when they would be put on hold for one of the other guys, but it was fun.